The enticing aromas of roasted chestnuts and hearty holiday foods fill the air, along with cries of street vendors hawking their wares and lamp-lit streets filled to overflowing with authentic Christmas treasures — hand-crafted candy, jewelry, pottery, perfume, dolls, and over 100 different items in all. It’s the one & only Victorian Christmas-full of new shows, sights, sounds and attractions. Welcome the holiday season in style in historic Nevada City, a quaint, Gold Rush town nestled in the foothills of the snow-capped Sierra where each year the town’s picturesque downtown transforms into a genuine Christmas card come to life. It’s a magical setting of hilly streets outlined with twinkling white lights and authentic gas lamps, wandering minstrels and carolers dressed in Victorian attire, and a myriad of visitors sharing holiday cheer and good tidings. This annual, family tradition takes place 2 Wednesday evenings and 3 Sunday afternoons in December and features holiday activities for all ages: carriage rides, live entertainment, savory yuletide treats and libations, and of course, Father Christmas! There is oh so much to see, hear, feast upon and experience at Victorian Christmas. Whether you’ve been naughty or nice…we look forward to welcoming the best of the holiday Season with you and yours! At locations throughout downtown, Victorian singers, bagpipers, brass bands and strolling minstrels provide warm Christmas music. Nevada City’s famous Walking Christmas Tree can be found, along with hot roasted chestnuts and horse-drawn carriage rides. Why not add to the party by dressing as a Victorian? We’re encouraging people to dress up and add to the Victorian nature of the event. You’ll find costume tips and ideas costume tips and ideas here. Parking can be difficult in Nevada City during Victorian Christmas. Broad and Commercial Streets are closed to through traffic. The Police Dept have asked us to let you know that parking is not allowed on “On Ramps” or “Off Ramps” of Hwys 49 and 20. Cars parked on the ramps will be ticketed and may be towed. Dogs on a leash are allowed at Victorian Christmas. 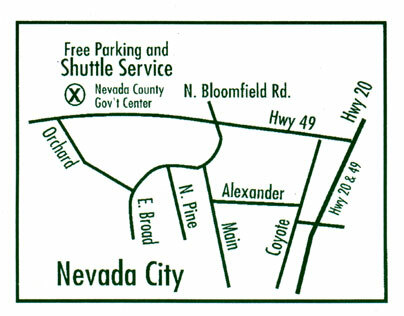 Drop your group off in town and then park your car and catch the Shuttle from the Nevada County Government Center, 950 Maidu Avenue, Nevada City CA 95959. Shuttle costs $5 for adults and children 15 and over. Children under 15 ride free. Return journeys are free for all. Shuttle hours are 4:30-9:30 pm Wednesdays and noon-6:30pm Sundays. Small dogs on a leash that can be on your lap are allowed on the shuttle bus. The Broad Street Overpass is for bus loading and unloading only. No bus parking on the overpass!! For information, contact the Nevada City Chamber of Commerce at (530) 265-2692 or toll-free (800) 655-NJOY. Victorian Christmas is a Rain or Shine event.